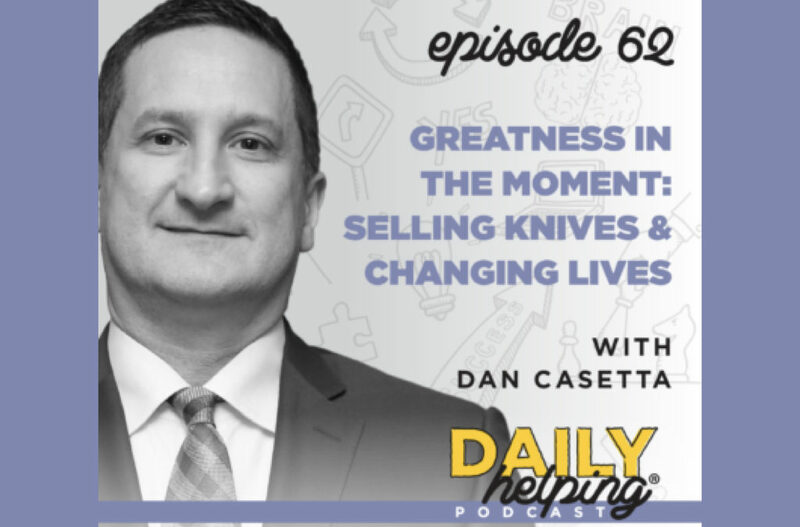 Today our expert guest is Dan Casetta, who helps build a dynamic culture of synergy and growth in sales teams, mastermind groups, and among his own family and friends. As a respected and trusted business leader, Dan has had a profound impact on thousands of people over the past 25 years. During Dan’s career with Cutco, he became the most successful and influential field manager in the company’s nearly 70-year history. Not only that, his programs for leading and developing teams were integral in sparking the company’s rapid growth. Plus, Dan is the mentor of two previous guests: Jon Berghoff and Hal Elrod. Dan is a spectacular coach and mentor in large part because he has always loved sharing great ideas with other people. Even while at Cutco, his teachings didn’t have much to do with selling knives – it was all about being a better person, setting goals, having a better attitude, thinking more productively, creating influence, and then sustaining all of that. Creating and sustaining long term influence is the key to finding success and creating an impact in many endeavors, especially in today’s increasingly entrepreneurial and online world. But how do we do that? One of the first things that creates influence is the ability to connect with other people, at a personal level; they have to be able to tell you have their best interest in mind. What we saw and how we talk is a simple but incredibly important aspect of influence. Jon wrote a chapter on this topic in Jon Berghoff’s book, Cutting Edge Sales. Your body language affects others’ impression of you, and that feeling will affect your ability to influence them. Your words and actions have to be congruent so that others feel that you truly believe what you’re saying. The best way to lead others is through example – if you want a team to work hard, you have to show a willingness to work hard and do whatever it takes. Dan (along with Jack Canfield) is also one of 24 authors who contributed a chapter to Success Starts Today. As you might expect, this book covers a pretty wide variety of topics, but Dan’s chapter (titled “Selling Knives and Changing Lives”) is about creating culture in an organization – and not just in a work organization, but in a family or team as well.